A couple of months ago we had brought the news. Micromax launched its flagship phone in Russia i.e. the Micromax Canvas Knight A350. Yeah we were expecting the smartphone to be launched in India. Since Micromax had been busy launching forgettable smartphones; they forgot to launch its iPhone-like looking smartphone in India. From today the phone will be available for sale across whole country. This phone does has some mixed reaction for me. Instead of just putting out an spec sheet. I will showcase Pros, Cons and Neutral features of Micromax Canvas Knight A350. Firstly we would start with the Pros, then Cons and the last Neutral Feature. I know this a Micromax phone and you wouldn’t be excited to read anymore. But trust me Micromax Canvas Knight A350 has some real balls. Micromax did lived up to the hype. It launched its flagship phone with an Octa-Core Processor (8 Processor cores in One Processor). The chipset used in Micromax Canvas Knight A350 is MediaTek’s MTK6592T SoC. The chipset clocks at 2GHz and has been also used in smartphone like Intex Aqua Octa. Even Chinese companies smartphones like Gionee Elife E7 Mini and iBerry Auxus Nuclea N2 sports this chipset. Taking inspiration from smartphone manufacturers like Samsung and HTC. Micromax Canvas Turbo A350 sports 2GB of RAM; which is a lot. Well for this feature we couldn’t ask for more. For the record this GPU supports 4K Resolution videos. Isn’t that Great?. One notable feature of Micromax Canvas Knight A350 are its cameras. The back panel sports a 16MP Camera and comes with auto-focus and flash. Now this camera can record 1080p videos at 30 frames per second with inclusion of Omnivision’s CameraChip sensor along with a new generation M8 Largen Lens. Now what do you think about the front camera? Would it be the same old 1.3MP or 5MP? For your surprise Micromax Canvas Knight A350 comes with a 8MP Camera at the front. Amazing! Isn’t it? But we do hope it works fine if not bad. The phone even comes with “Camerrazi” photo app which adds features like 360 Degree Panaroma, Cinemagraph and Object Eraser. The phone comes with an Anodised Aluminium Body. Design-wise it definitely looks like an iPhone. What you guys think? The bezels have champagne gold brushed metal styling. While the back panel has a glass finish. From this we can say; the back panel isn’t removable. 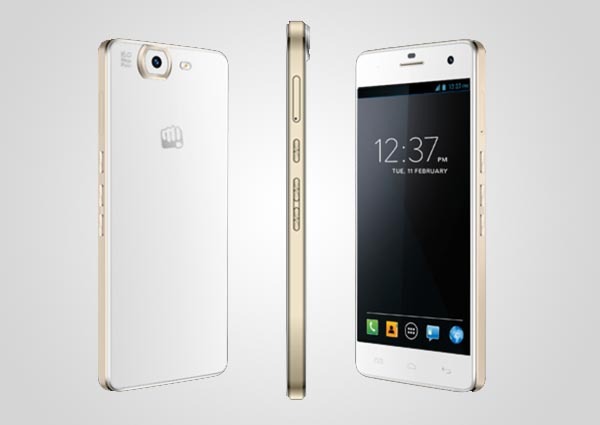 Micromax Canvas Knight A350 comes in three colors Black, White and Gold. The display is what we expect from a flagship phone. A 5 inch display with 1920X1080 resolution. This display clock pixel density of 443ppi (2 ppi greater than Samsung Galaxy s4). The display is developed by Sharp. It is a full HD CGS (Continous Grain Silicon) IPS display. So display performance will be similar to Micromax Canvas Turbo A250. The phones has some pretty awesome pros but it does comes with pitfalls too. What do we expect from a flagship phone? An Android Kitkat 4.4 but unfortunately Micromax gives us an old Google Android JellyBean 4.2.2. We all do expect to get a Kitkat update as sooner as possible. Micromax! are you listening? I definitely avoid phones with no expandable memory. Micromax Canvas Knight A350 comes with a large 32GB Internal Memory, with no expandable memory. The biggest con of not having an expandable storage is; whenever your phone malfunctions, the option option available is format, then you lose all data inside the phone including user files and media which we usually store in memory card. But still 32GB internal memory isn’t pretty bad. A phone with this magnitude we expect it to come with a larger battery. But Micromax Canvas Knight A350 comes with a measly 2350mAh battery. The size of battery may sound alot but a phone with full HD display and octa-core processor demands more juice. After Pros and Cons we come to Neutrals of this phone. Its a usual affair. This phones comes with Wifi, GSM and 3G connectivity options. Expecting 4G LTE from this phone is much of a drag. But at a budget point and in India we don’t require it now. Accelerometer, Gravity, Light, Gyroscope, Compass and Proximity. A decent amount of sensor. Nothing more to add here. GPS and A-GPS is present in the phone. We do expect the phone to come with GLONASS for added functionality. The pre-installed games are Where’s my Perry, Where’s My Water along with RealSteal WRB. So what do think about the Micromax Canvas Knight A350? Did it excited you or just the same every Android Smartphone? Let us know your view in the comments section. Share the news with your dearest friends on Social Media sites like Facebook, Twitter and Google+. This mobile phone is awesome….I am going to buy it….. I am very glad that you liked the post and phone too. Do keep visiting this website for furthur updates. Thanks for the response. Thanks For Sharing Specs of This Micromax Smartphone. I’m gonna buy this phone but I’m confused reading all reviews can some one help meeeere………..